Finn is officially a Daddy's boy. I truly think he prefers Conor which is so cute to see. While Liam loves his dad, he's always been completely attached to me. It's fun to see the little differences arise between our two boys. With each day that passes, the bond between my two boys grows & grows! I love watching their relationship develop! This month brought on the smiles (although he's not exactly giving them out for free) & lots of standing. Finn's head control is amazing; he is constantly pulling his head up and trying to get us to let him sit or stand in our arms. He's my strong strong boy! Height & Weight: We had Finn's 2 month check up about 1.5 weeks early due to our vacation, so unfortunately it's hard to compare his stats to Liam's. Plus, I forgot the exact number, so I will have to update later. However, I do remember that he was 97% for height & 94% for weight... So he's pretty much just huge! Eating: He eats like a champ & seems to be adjusting to my oversupply well! He's still an efficient nurser which makes feeding Finn & taking care of big brother fairly easy. Sleeping: He usually only wakes once a night (halleluia) and will typically sleep for a good 5-8 stretch to start off the night. Occasionally he'll go longer. I'm enjoying these long stretches of sleep, because I am still convinced they will not last! Finn still mostly cosleeps with Conor while I deal with Liam's night wakings (who is now only waking about once a night)! I'm currently getting some of the best sleep I've had in the last 3 years. Health: He's a big, strong, healthy boy. His collarbone is still healing perfectly; although we do have to do a few stretches with his head & neck since he was pretty smushed in utero. Otherwise no issues! Likes: Still loves trees & watching big brother! And now a big fan of standing! Other Points of Interest: Finn had his first flight! His performance was only mediocre, so let's hope for better next time. Especially if he's going to be a part of this family that flies all the time! Our little traveler has now been in three states: Utah, Washington, & Idaho. Montana is next! When I pull out the camera, Finn gives me one expression. Only one. Every single time. Let's hope next month brings out his little personality more! Finn's expression is adorable! I can see little glimpses of Liam in him too. That's great he's still a great sleeper! And nice that Liam is now waking only once. Since I've started co sleeping with noah for the whole night, he's started sleeping through the night... I'm finally getting sleep and it really is wonderful. And that is so cute that Finn is a daddy's boy so far. Noah is like Liam and totally prefers me. I joke that if we have another Chris gets to "have" that baby since noah is "mine". His expression is too cute!!! Glad to hear he's doing so well!! Enjoy your trip!! Thanks! The expression just slays me...especially since it's his signature! He is such a chunky monkey & I love it!!! I'm absolutely convinced the extra fluff helps them sleep better in the night. At least that's what the old wives say! ;) it's been completely opposite over here with the bonding. Ben seems to be all mama while Lily was (and very much still is) a daddy's girl. I keep wondering what would happen if we were out numbered. Ha! He is too adorable! Way to go already building up his travel adventures! Wow I can totally see a little bit of Liam in Finn's expression in the last picture! I'm so glad he's sleeping well for you! Gives me hope for what December brings! 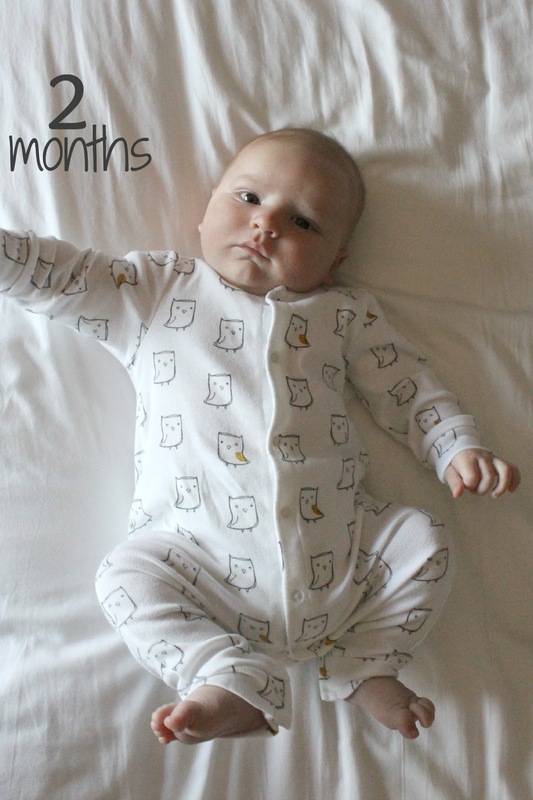 I can't believe Finn is 2 months old already!! He is so adorable especially that expression of his ha! oh my gosh, Finn is A-D-O-R-A-B-L-E!!!! so awesome that him and Liam are becoming buds :) I always loved having siblings and love the bond we all share to this day! So cute!!! Such a big, beautiful baby! Happy 2 months Finn!! Glad he's a healthy and happy boy! So cute! That is one gorgeous child! :) You all make some seriously adorable babies. I love that he's so serious in photos. And I'm shocked that you're getting so much sleep with a newborn and a toddler! Keep it up! Mim's finally sleeping through the night and I now have 2 kids clocking 10-11 solid hours a night (knock on wood). It's AMAZING.